There are many wonderful places to visit on Colorado Weekend Getaways. The Rocky Mountains are a beautiful backdrop for a great vacation Colorado any time of year. Outdoor activities are in abundance with many choices such as skiing, snow boarding, cross country skiing, hiking, 4X4, biking, climbing and more. If you just need to "get away from it all", the awesome peace and spectacular scenery of the Rocky Mountains make it a perfect choice. Here are some ideas for great Colorado weekend getaways, all with easy access to Denver International Airport. Breckenridge Colorado Vacations planner includes activities, restaurants, and lodging such as B&Bs and vacation rentals in this upscale ski resort and great summer destination. Check out the Denver Vacation guide for information on hotels, restaurants and Denver attractions in the Mile High City....there's lots to see and do! 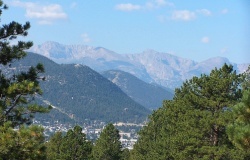 This Colorado Springs Vacation planner has tips and information on Colorado weekend getaways or vacations in this city with the gorgeous setting. Pike's Peak and Garden of the Gods are a couple of the highlights. Guide to Rocky Mountain National Park Vacation with advice on what to do and where to stay in this interesting and unique area. Don't miss the famous Trail Ridge Road. 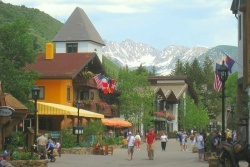 Vail Co Vacation Guide includes hotels, restaurants and things to do in this popular resort town...ski in winter and hike or just enjoy the amazing scenery in the summer. Colorado is a great place for a family vacation or weekend getaway....anytime of year. You will want to check out these Colorado Vacation Rentals or the ones below for the perfect place to stay on your vacation. This Colorado lodging option gives you plenty of space to relax, cook some meals if you wish and lots of peace and quiet! This Victorian mining town high in the Rockies is about 2 hours from Denver....perfect for Colorado weekend getaways. Gold was discovered here in 1860 and silver in the late 1870s. 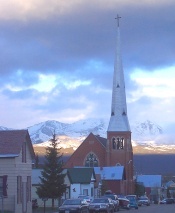 Leadville's unique character, restoration on the 70 square block historical district, and many outdoor activities make it a great choice for Colorado weekend getaways. Majestic Mountain Escapes - a 4 bedroom home located 10 miles south of leadville, CO.
Delaware Hotel is an 1886 hotel, museum, and flea market. Grand West Village Resort, Ph. 800-691-3999a mountain style resort of condos tucked in the tall pines just north of town. An 1895 Victorian with a homey feel, Leadville Inn has a variety of rooms and prices. Ice Palace Inn is a lovely Victorian home with elegant rooms and extra amenities. Quincy's, 416 Harrison Ave. - try the Filet Mignon, Golden Burro Cafe and Lounge, 710 Harrison Ave. - Victorian furnishings, old photos, and comfort food, Columbine Cafe, 612 Harrison Ave. - American, vegetarian and breakfast all day. Have you been to Colorado before? Do you have a favorite hotel or attraction that everyone should know about?